In May 1962, The Beatles were in the middle of their residency in Hamburg when an excitably-written telegram arrived from London. Their manager informed them he had secured a recording contract with a subsidiary of EMI Records, and they should return home for their initial recording session. 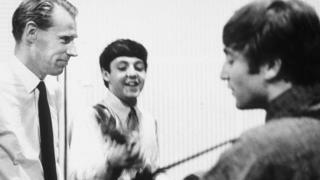 In fact, all Brian Epstein had secured was an audition with producer George Martin who was, at that time, best known for making comedy records with Peter Sellers and Bernard Cribbins. Furthermore, Martin himself was sceptical of the band's chances. "I wasn't too impressed with the tape Brian Epstein had played me," he told Desert Island Discs in 1996. "There was something there but I couldn't find out whether it was worthwhile or not. "He was so disappointed. I felt really sorry for him, actually because he was such an earnest young man. So I gave him a lifeline. I said, 'If you want to bring them down from Liverpool, I'll give them an hour in the studio.'" The band duly set up in Studio Three at Abbey Road on the afternoon of 6 June, 1962 but their road-worn instruments initially caused some problems. Worst of all was Paul McCartney's amp, which was distorting so badly that engineers had to wheel up a vast replacement speaker from EMI's echo chamber. "I got nothing out of The Beatles' equipment except for a load of noise, hum and goodness-knows-what," engineer Norman Smith later told Sound On Sound. Problems solved, the band launched into their first song - a cover of Consuelo Velazquez's bolero ballad Besame Mucho (Kiss Me A Lot) - at around 19:00. "I remember Martin taking a quick look at them and leaving for tea," said sound engineer Ken Townsend. But when the band launched into their next track, Lennon and McCartney's Love Me Do, tape engineer Chris Neal was sent scurrying down to the Abbey Road canteen to grab his boss. He arrived and took over the session, although he was still unconvinced. "I thought their music was rubbish," he told the BBC's Arena programme in 2011. "I couldn't really make out for myself what I was listening for - because I was so conditioned to [hearing] a solo singer with a backing group. But here I had four people who were all doing all sorts of things. "It wasn't Cliff Richard and the Shadows, that's for sure." The band went on to record two more numbers - P.S. I Love You and Ask Me Why - before the session ended around 22:00. Martin invited the band back to the control room and explained, at great length, where he felt they were going wrong. "We gave them a long lecture about their equipment and what would have to be done about it if they were to become recording artists," recalled Norman Smith. In particular, Martin focused on Pete Best's drumming, explaining that what worked on stage at Liverpool's Cavern Club wasn't appropriate in the studio. Best was sacked and replaced by Ringo Starr as a result (although even he wasn't permitted to play on the later, finished version of Love Me Do - that was done by Scots session drummer Andy White, who died last year). Best's mother was furious, and phoned Martin to complain. She later told Liverpudlian journalist Bill Harry (who covered The Beatles' rise to fame for the Mersey Beat newspaper) that the producer had been taken aback by the band's decision. "I never suggested that Pete Best must go," she reported him as saying. "All I said was that, for the purposes of The Beatles' first record, I would rather use a session man. I never thought Brian Epstein would let him go. He seemed to be the most saleable commodity as far as looks went." Back at Abbey Road, Martin gave The Beatles the chance to respond to his dressing down. "I've laid into you for quite a long time," he said. "You haven't responded. Is there anything you don't like?" "Well, for a start," replied George Harrison, "I don't like your tie." The quip broke the ice and The Beatles relaxed into comedy mode. "For the next 15 to 20 minutes they were pure entertainment," recalled Norman Smith. "I had tears running down my face." Despite his misgivings, Martin eventually decided The Beatles had "the potential to make a hit record" and gave them a recording deal on 6 June (backdated by two days so as to secure copyright to the recording session). He later admitted it was their "tremendous charisma" rather than their music that won him over. "When you are with them, you are all the better for being with them and when they leave you feel a loss," he told Sue Lawley. "I fell in love with them. It's as simple as that."